Without a doubt, and I am sure Philip will agree, Day 3 is the hardest part of the competition for both the athletes and the support team. A fifty two mile run is a long way plus it's the last day of the competition and the body, mind and spirit are all tired. 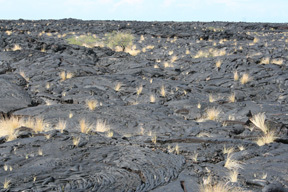 Imagine running through black lava fields in the middle of the day... hot, hot, hot! The day started off well with Philip leaving Hawi at the crack of dawn taking advantage of the cooler morning temperatures. Because this 52.3 mile run is right through the lava fields, it gets very hot during the middle part of the day. Philip decided to follow a customized version of the Galloway marathon training program; running for 7 minute stretches followed by 3 minutes of power walking. The run/walk combo allows the body to conserve energy and recover during the walk cycles. 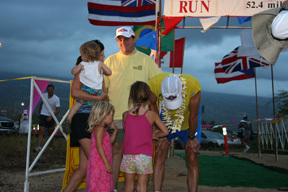 It also allows the support team to hydrate and feed the athlete preventing dehydration in the hot, Hawaii sun. When Philip stopped running I would walk with him (it actually felt like I was running however) handing him water and food. His diet consisted of a 50/50 water Gatorade mixture with gel packs that provided about 100 calories of easily digestible energy. Especially as the day wore on, We also took the opportunity to keep him cool. We were in the black lava fields on black pavement; it started to feel a little like an oven. 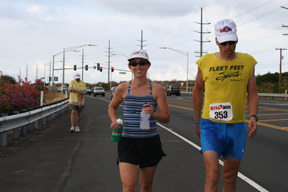 Despite occasional stops to work on Philip's right knee and quadriceps, he was on schedule completing the first marathon (26 miles) in 5 hours. 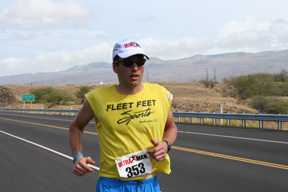 After about the 35 mile mark, Philip began to show the effects of 3 days of racing. His running period grew shorter and his walk sessions increased. Fortunately we were able to keep him hydrated and forced him to eat power gels every 15 minutes (51 gels in all that day). After 11 hours and 40 minutes, just 20 minutes before the official cut-off, Philip crossed the line. It was a tough, emotional and rewarding time watching him wearily cross the finish line. To his testament, Philip gritted it out and finished the three day event. Where some athlete's have mood deterioration as they get tired; Philip was great to work with and provided a once in a lifetime experience for me as his trainer. I thank him for that opportunity; the Ultraman as well as the Big Island of Hawaii will always hold a special place in my thoughts.